Going solar is still a good investment even with the newly imposed solar tariff. Our 10 Compelling Reasons to Go Solar are still as valid today as they were before President Trump imposed a new tariff on imported solar panels! Even with the new U.S.tariff on imports of solar panels, now is still a great time for consumers to go solar. Thanks to some planning on our part, we have a stockpile of panels that we purchased in advance of the tariff that allows us to keep our pricing low… but only until those panels are gone. Act now to take advantage of today’s pre-tariff pricing on solar panels! Supplies are limited. Contact us today to learn more. 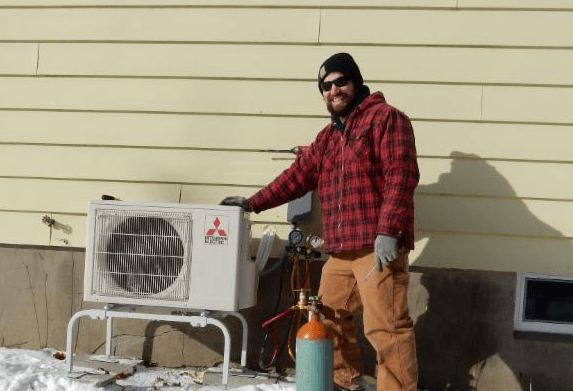 With the arrival of below zero temperatures in our area, homeowners are asking what they can do to make sure they are getting the most from their heat pumps to keep their homes warm. Even cold air contains some heat and with Mitsubishi’s renewable heat pump technology, this heat can be captured even when temps fall well below ZERO. For homeowners who have made aggressive energy improvements to their homes and installed heat pumps in locations intended to cover the whole home’s heating needs, your heat pump can keep working to keep you cozy warm. As these extremely cold temperatures are forecasted to remain in our area for about another week, we wanted to take this time to remind you of a few tips to get you through this cold snap. Please keep in mind these tips are intended for people operating a zero energy home without supplemental heating options. If you have a supplemental heat source, you may want to use that. 1. Turn the heat pump temperature up. 76 degree F is not too warm! Remember, you are trying to heat the whole house from one location. You do have to overheat the room(s) with the heat pump in order to make enough heat for the rest of the house. The colder it is outside the bigger the temperature difference will be between the core of the house (with the heat pump) and the rooms (without the heat pumps). 2. Manually turn the fan speed to high. It is likely that the heat pump will never kick into high fan speed on its own – it’s just the way the programming is set. To get maximum heat out of the heat pump, move maximum air through the heat pump head. It’s noisier so you may wish to only turn the fan speed up when you leave the room. 3. Do not turn the temperature down in order to save energy.You need the heat pump to give you everything it’s got, and that includes every minute of the day. At these temperatures the heat pump capacity is noticeably lower. Don’t restrict your heating to just part of the day, because there won’t be enough hours in the day to deliver the heat your house needs. Keep the temperature at or above your comfort temperature all the time. 4. No need for extra ventilation. You’re getting extra natural infiltration when it’s this cold (just due to the difference in buoyancy between the inside air and outside air), so you probably don’t need to add extra ventilation for fresh air. If you typically leave a window cracked, close it. If you have a ventilation system, put it on low speed or off for a day or two. If you have a heat pump water heater, we recommend you use the electric resistance mode. Remember, a heat pump water heater is an air conditioner in your basement. Usually, the house can handle that extra bit of cooling, but when it is extremely cold outside, you want every Btu of heat to be available for your comfort. The water heater can get its own heat from electric resistance without impacting the air temperature of the house. Keep it in resistance mode until it stops impacting your comfort. Just because the basement is cold doesn’t mean your comfort is impacted. However, if the water heater actually makes your living spaces uncomfortable leave it in resistance mode. At the latest turn, it back to heat pump mode April 1st. Some years you may never need to put it in resistance mode. For more information on how to make the most of your heat pump, see 8 Tips from Efficiency Vermont. Reduce your reliance on Fossil Fuels by adding a Solar array to your home. LEARN MORE. CONTACT US today for a free site evaluation and quote. Is Your Home Ready for the Upcoming Winter Heating Season? Start with an Energy Audit to learn how you can improve the comfort of your home with air sealing, insulation and ventilation. CONTACT US to learn more. The cost of spray foam insulation can sound daunting to many homeowners especially when compared to cheaper alternatives like Fiberglass Insulation. While fiberglass can be significantly cheaper is also way less effective and not as energy efficient especially in the extremely cold conditions that are common to Vermont winters. Closed cell spray foam works better than any other options because of its expansive nature that allows it to tightly seal all nooks and crannies effectively. It has an R value per inch of 7, the highest on the market. Because closed cell spray foam covers nooks and crannies effectively, it provides an excellent air barrier and is extremely energy efficient. Closed cell spray foam has been shown to provide energy savings at an average of up to 50% or more. Closed cell spray foam insulation is uniquely capable of thoroughly sealing holes & cracks in your attic or crawl space. Air leaks are one of the biggest culprits of high energy bills. Spray foam insulation creates a powerful airtight seal that is 24 times less permeable to air infiltration than other types of insulation. Holes & cracks in walls and crawl spaces can allow entrance to more than just air. Water and moisture can gain access to these areas through exposed cracks and holes if not sealed. Spray foam insulation is impermeable to water. Meaning, not only does it thoroughly seal and protect from airborne moisture and leaks but it will not absorb the water like other materials if flooding was to occur. Spray foam is not only water-resistant but it is composed of an inert polymer that provides no source of food for mold or bacteria. Homes insulated with closed cell are better protected against mold and mildew. Spray foam is comprised of inert polymer which allows it to have an indefinite lifespan. The benefits of spray foam can be enjoyed for years before needing to reinsulate. It performs at optimal levels for extended periods of time. Spray foam helps reduce energy consumption thus creating a ‘greener’ household. It protects against moisture and mold growth and it is designed to last indefinitely producing fewer consumed materials. Deciding whether or not to go solar is a major life decision with significant upfront cost that requires careful consideration. Energy from the sun can power your home while reducing or eliminating your electric bill, fuel your electric car and even help to create a cleaner, healthier environment for everyone. But wait… there’s more… lots more! Have you been wondering what it is you can do to help save the planet? Reduce your reliance on fossil fuels by harnessing the power of the sun! It’s a clean source of energy that doesn’t produce greenhouse gasses or other harmful emissions. While the initial investment to go solar may be large, in the long run using solar power will help save money. Solar will drastically reduce or eliminate your electricity bills. Harness the power of the sun to generate free power during your system’s 25 plus year lifespan. Even if you don’t generate 100% of the energy you consume, you will still drastically reduce your bills and save a lot of money. Don’t look at solar as an expense, but rather one of the best ways you can invest with returns rivaling those of more traditional investments like stocks and bonds. Take advantage of the Federal Tax Credit to greatly reduce your initial investment. New studies have shown that homes equipped with solar energy systems have higher property values and sell quicker than non-solar homes. Appraisers are increasingly beginning to take solar installations into consideration when placing values on homes, and as homebuyers become more educated about solar, the demand for properties equipped with solar will continue to grow. One of the most clear-cut benefits of investing in solar now is the ability to hedge utility prices. You can fix your utility rate and protect against unpredictable increases in electricity costs. You will no longer be at the mercy of your utility providers. They can raise energy costs all they want but you won’t be affected because you are generating your own power. The sun is a nearly infinite source of energy and a key component of achieving energy independence in the United States. By increasing our capacity to generate electricity from the power of the sun, we also insulate our country from unpredictable price fluctuations in global markets that are notoriously unstable. The Solar Foundation sites Vermont as a national leader in the solar industry, ranking third for the number of solar jobs per capita. According to the 2016 Solar Job Census, 1 out of every 50 new jobs added in the United States was created by the solar industry, representing 2% of all new jobs. This growth is expected to continue. There is a myth that solar power can only be used when the sun is up and shining. Since the majority of homes with solar power are connected to the grid, you do not risk a power outage at night or on a cloudy rainy day. Through the process of net-metering the excess solar energy you generate that is not used to power your home is sent to the grid and you receive credits to use when the sun is down and your panels are not generating power. If you own a business, you know that sustainability and corporate responsibility are important components of an organization’s culture and values. They also produce bottom-line results. Consumers are increasingly aware of a company’s commitment to the environment and typically reward businesses that choose to operate responsibly. ‘Green’ credentials are a powerful driver of consumer’s purchasing decisions. Going solar now puts you ahead of the curve. Deciding whether or not to go solar is a big decision that requires careful consideration but the benefits you’ll reap are undeniable. Go solar today and be a part of the solution. CONTACT US today to learn more about our solar energy services. The arrival of Fall means cooler weather is just around the corner and it’s time to switch gears from cooling to heating. To maintain optimal comfort, drive energy efficiency through the heating months, and protect your HVAC investment, Mitsubishi recommends you clean your filters regularly. The simple act of cleaning your filters will make a big difference to the quality of the indoor air you breathe by removing any accumulated dirt and allergens that build up over time. Regular cleaning will also help improve efficiency and prolong the life of your heat pump unit. Cleaning often, rather than waiting until the filters are filled with dust and pollen is always the best option. Remove the front panel to access the air filters. (see Operating Manual) Mitsubishi recommends you clean the air filter (the smaller of the 2 filters) every 2 weeks. Simply remove any dirt build up by using the brush attachment on your vacuum cleaner, or rinse with water then place in shade to dry. The air cleaning filter (this is the larger of the two filters) should be cleaned every 3-4 months and replaced once a year for best performance. Remove dirt using the brush attachment on your vacuum cleaner. When dirt cannot be removed by vacuum cleaning, soak the filter and it’s frame in lukewarm water before rinsing it. (Diluted mild detergents can be used) After washing with water, dry it well in shade. Note: If the heat pump has been cooling, it may be wet from condensation. This will make it difficult to vacuum. For best results, attempt to clean only after the unit has been off for at least 5 hours. Also, do not touch the heat exchanger with your bare hands. It is best to wear a pair of gloves to avoid injury. IF YOU HAVE A BALANCED VENTILATION SYSTEM LIKE AN HRV OR ERV, FALL IS THE PERFECT TIME TO LOOK INTO CLEANING OR REPLACING THOSE FILTERS TOO! Reduce your reliance on Fossil Fuels by adding a Solar array to your home. CLICK HERE to learn more. CONTACT US today for a free site evaluation and quote. Spray foam insulation is developed from 2 types of composite material, polyurethane and isocyanate. When combined, the 2 materials chemically react to expand and harden. During the insulation process, the 2 materials are sprayed at the same time from the tip of a spray foam gun allowing them to expand and form a protective layer of spray foam insulation over a designated area. Spray foam is widely promoted as a green building material for its ability to improve energy efficiency. It insulates better than fiberglass or cellulose leading to major heating and cooling cost savings for a homeowner. While all spray foams contain petroleum-based chemicals, some manufacturers have ‘greened’ their formula by reducing the percentage of petroleum-based chemicals in their polyol resin component and replaced that with resin derived from soy oil or castor oil. These are known as soy-based foams. Building Energy has been using a non-toxic soy based foam for almost a decade. This is a safe, environmentally friendly foam with the highest R values and quality. HEATLOK SOY®, a closed cell Spray Polyurethane Foam Insulation, has a unique ecological benefit that recycles plastic waste into a Rigid Spray Polyurethane Foam. This helps to more efficiently utilize the world’s nonrenewable resources. HEATLOK SOY® can reduce excess waste and energy consumption in buildings by up to 50%. This is an excellent closed-cell spray foam insulation/air-barrier used in areas where relative humidity levels exceed 55%. For more informative information on insulation be sure to head to the Building Energy’s Weatherization-Insulation blog. Building Energy provides a full range of energy services to help make your home or business more energy efficient. Start with a Home Energy Audit to determine if Air Sealing, Spray Foam and/or Cellulose insulation is right for you and take advantage of the many incentives Efficiency Vermont has to offer. Head to Building Energy weatherization and insulation services page for more information! For the first half of 2017, solar panel prices were steadily declining but now prices have been increasing (by as much as 20 percent, in some cases) due to fears of a looming tariff. Lock into today’s lower prices with Building Energy! Panel prices are set to rise in the next month but we agree to hold our current panel pricing until the end of October for all customers with a Proposal dated prior to September 15, 2017. Whether you have a proposal in hand or are interested in getting a free quote, contact Nik today to find out how you can lock into our current lower pricing. Don’t miss out on this opportunity. Call today! Ice Jambs on the north side of the house are being caused by insulation and air barrier gaps on the sloped ceiling, kitchen soffit and dormer walls. The house has a high air infiltration rate due to the inadequate air barriers in family room attic. The main attic fiberglass insulation should be replaced so that the entire flat attic plane can be air sealed. This would be relatively easy to do when the home is being reroofed. In the attic on both sides of the storage area and the floor above the master bath: air seal with spray foam and/or dense pack cellulose contained by stapled netting. Above the kitchen soffit, from the side of the dormer wall and slant rafter cavity: spray the side wall with 3” of foam and cap the corner. Inject cellulose into the rafter bay between the dormer wall and family room to 16” deep loose fill. Family room flat attic: remove poorly placed fiber glass insulation and air seal. Inject 16” of loose fill cellulose over the attic flat. Kitchen Soffit: spray foam 7” into rafter bays from eave to the dormer wall and all along the top of the wall above the soffit. Also add cellulose insulation in Kitchen soffit. Clear story: spray foam 5.5” of spray foam on all four sides.